Last edited by RickI on Thu Apr 07, 2011 2:56 pm, edited 2 times in total. Had another cold front squall line yesterday, bringing winds gust to 40 to 60 mph +, tornados, waterspouts and offshore wind shifts. This was the second violent front in a week. Many dozens of kiters have been killed in these worldwide and likely hundreds injured including paralysis, brain trauma, major and minor bone fractures along with damaged or lost gear. Kiters still go out in them due to a lack of apparent understanding and respect for just how easily and badly they can be messed up. Gear has improved but not enough to allow you to risk this sort of violent weather. These squall lines are usually easy to see and avoid. Some people just don't try or ignore them. This squall line could be seen days out working its way across the country and causing damage along the way. You could see it was going to be a bad one before 8 am way up near Tarpon Springs above Tampa that morning through radar, real time winds and hazard forecasts. 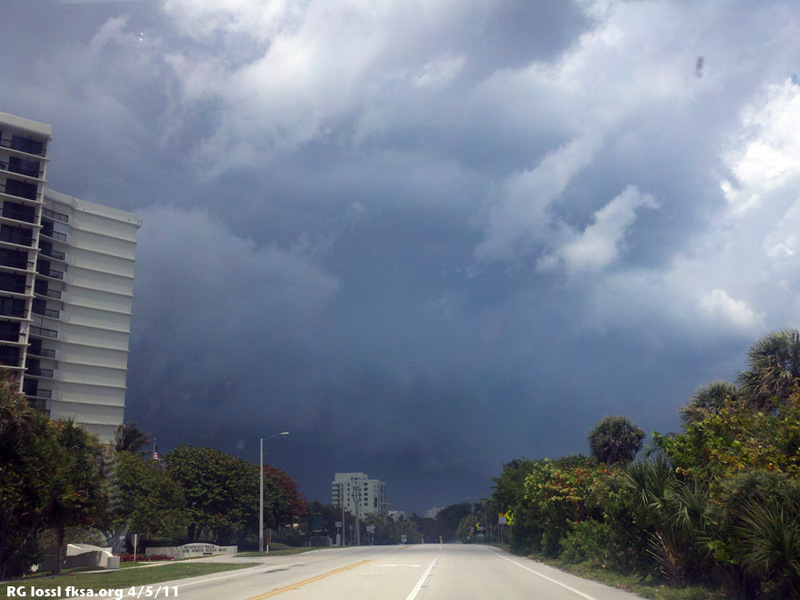 Driving northward through Boca Raton, FL along the coast at 1:45 pm when the squall line passed over. The wind spiking in Royal Palm and at Port Everglades in Ft. Lauderdale. It was slamming through South Florida hours later, spiking the wind into the 40 to 55 mph range. The hazardous winds usually passed within an hour, this time. Sometimes they take longer. 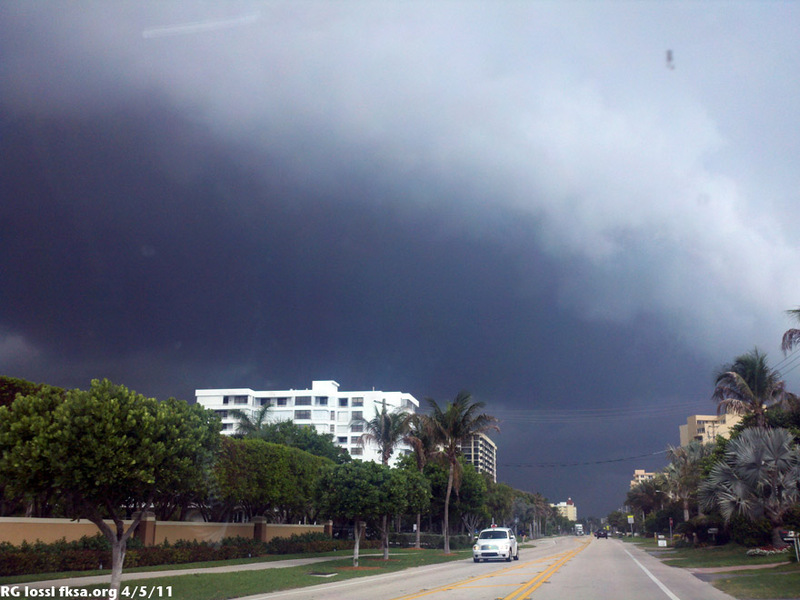 I stopped at Delray Beach to shoot a shelf cloud that was flowing out to sea. Apologies for the poor stitching job, something about these images is confounding several different pano applications. I had to use a Droid-X telephone for the images, usually not that bad in a pinch. This is a short interesting video of the same cloud drifting seaward under a sudden strong west offshore wind. I saw something about 3/8 mile offshore and couldn't quite make out what it was other than it was heading offshore in the face of the squall. I almost called the USCG thinking it might be a disabled kiter, windsurfer or ? I asked a couple of kiters who set me straight. It was someone's kite, inadequately anchored for a 90 degree wind reversal boosting to 35 kts., imagine that, that was ripped from shore likely to be lost. The only sure way to secure kites before a storm is to roll them up or at least take the lines off and deflate the leading edge well anchoring it with sand. Wouldn't it be interesting if someone got caught in the lines of a powered up kite heading offshore? A kiter died of hypothermia in CT after chasing his kite a short distance offshore in the face of a similar squall line wind shift. He was adrift in the dark perhaps for ten hours in December before he succumbed. There is a lot to know about weather or take it more basically. Do your weather planning and monitoring, if something threatening moves in, land and secure EARLY. Don't screw around, a percentage of us will pay, some dearly for staying out too long. There is a curious absence of input on this. Some people were panicking a while back about a video clearly intended to promote staying out of squalls, mysteriously accomplishing the opposite. Here is a post that could use some discussion about squalls and the harm they can do, for folks who are truly concerned about the hazard. I could bring the video back if that would help. There is some interesting squall footage in it. Way too many people are going out in this stuff, I assume because they don't realize or perhaps appreciate just how truly evil things can get. Where is all that passion about keeping people out of these hazards now? For anyone that is going to pipe up that is is ok to ride in this stuff, I would really appreciate it if they would checkout the following video first of somewhat average squall conditions. 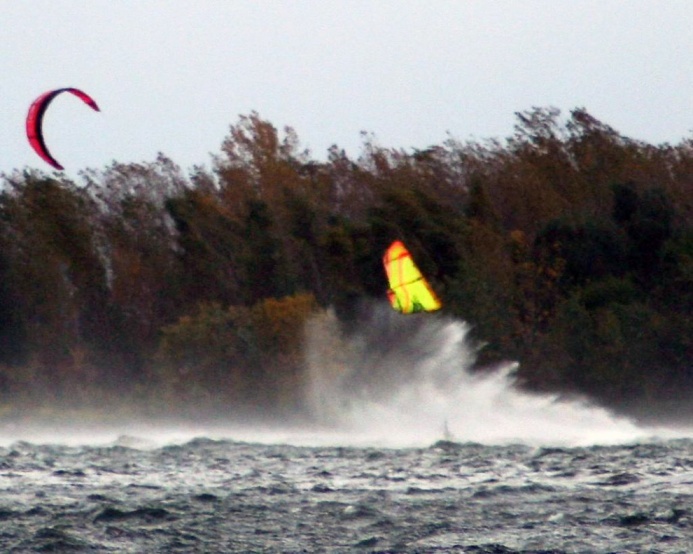 Lots of kiters have been hurt and killed in weaker weather than what shows up in the video. Until it hits you really don't know what it will toss out. This was from a cold front squall line a week ago in Central Florida, it did a lot of damage. Checkout the windgraph in Tampa Bay about 30 miles to the west. Hours of honking strong conditions, all from one squall line. I think it is another great post!! How would you fare if you are already out riding? I mean looking at the spike in the wind, and the extreme direction change, there is not many wind reports that would suggest such extreme changes? Though I am probably one of the people that are getting more "used" conditions, there has been times where I chose to not go out, but sometimes it might be hard to properly estimate what are the more extreme clouds. In the winter we can get these pretty bad looking clouds, but they are normally not as bad, so people tend to try to get, or ride them out...but every now and then (rarly) they can be pretty viscous, which makes it pretty hard to judge. Let's say you are doing a downwinder and you see something like that approaching? What do you do? like those fronts are not possible to see...big no no to stay out, rig or do whatever! Thanks Alex and for your input! 1. Marine and hazard forecasts, how much wind, directions and changes, temperature changes, violent weather risk, etc..
2. Weather or frontal map in loop you get a feel for what is coming and how fast. 3. Color radar and satellite imagery helps you get a better feel for what is coming, from what direction, how fast approximately and when it might be in your area. 4. Real time winds, same thing again, how much wind change, critically direction change, squalls implied by violent direction changes or a 90 degree swing and wind spikes or no potentially. Examples from the last week in Florida are embedded above in this post. Riders should always be aware of weather conditions around them. Are there clouds moving in, threatening or not? Wind lines, white water from upweather, water spouts (we get plenty in these and in other waters), funnel clouds, stuff of interest to a kiter in short. Detect it, act early as indicated. Would you fly a plane or sail a boat into harms way without knowing this stuff? The same applies to kiting well supported by myriad accidents and incidents. If you are out and you see threatening weather move in, analyze the threat, make a plan and act on it with haste. You want to be on the beach and secured BEFORE there is any significant change in wind speed, direction, temperature or threatening clouds come very close at all. These systems can move very fast, a mile a minute. Meaning you may have ten minutes or perhaps only a few minutes or less to act if you are caught off guard. If you still have a kite up, can't land in time, I would suggest Emergency Depowering your kite as appropriate for whatever you are flying. With BOW kites usually** that means bringing it low to the side of the window and pushing the bar out to depower. If you can effectively flag your kite DO IT. Some BOWs loop if flagged. Knowledge and experience with YOUR system in advance is essential. Be ready to release your leash attachment if your kite maintains or develops power through looping etc.. You should have strong swimming skills and be wearing an impact vest so staying afloat shouldn't be a big concern. Fronts can shift winds violently offshore sending you away from land, like the one in this example. Getting back to shore under your own power may be a problem if you drift very far, are injured or become hypothermic. Riding with others, letting someone know your float plan on shore and having emergency signally gear, at least a whistle may be about all that is left to you. There are lots of variations in the accident and incident record, some real bad ones too. You have REALLY screwed up if you find yourself in this position as the outcome can be uncertain. It is important to have good ideas about what to do in a crisis like this but the real priority in practice should be avoiding ever falling into it. It isn't that hard to avoid in my experience. It doesn't take that much effort to avoid high wind emergencies/squalls if you prepare properly for your kite sessions, where fronts are concerned anyway. Different knowledge but similar procedures apply in weather planning for tropical systems. Thermal or convective/sea breeze squalls are somewhat similar but can happen much faster. There are regional hazardous weather conditions in different parts of the world that may have similarities and dissimilarities to this. Input on the threats and what works in your area would be much appreciated. ** The kiter in the video in Bimini did the opposite MASHING his bar up through the Recoil spring and slowly bringing his kite to the zenith apparently even more effectively killing the power. IF he hadn't mashed the bar up with such force from examples shown in the same video, he likely would have been lofted badly. We never really did properly discuss this. With most kites, I would never bring the kite to the zenith regardless in an high wind emergency. With the Cabrinha, I am still undecided. tautologies wrote: I think it is another great post!! Last edited by RickI on Fri Apr 08, 2011 2:27 pm, edited 5 times in total. Toby wrote: like those fronts are not possible to see...big no no to stay out, rig or do whatever! 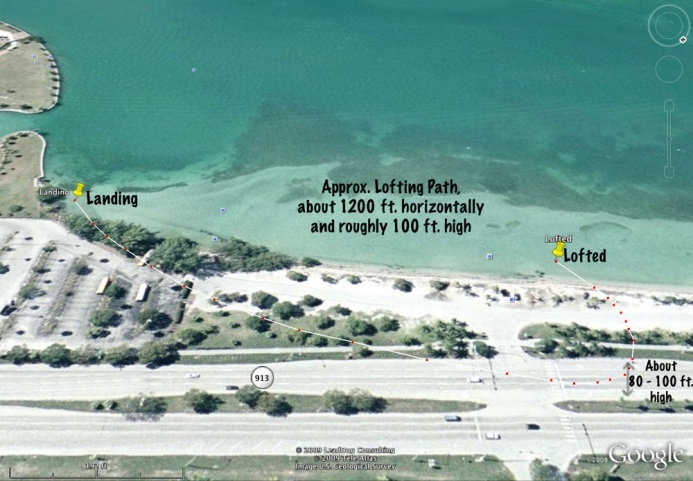 True Toby, but like in the case of the infamous lofting on Ft. Lauderdale Beach* a few years back, it really pays to do your weather planning online in advance. You can see the clouds sometimes they are hellish as in the two examples in Florida in the last week or at times more subtle in appearance but just as violent. You can decide whether it is even a good day to go out, when, with what size kite and to have advanced knowledge of what might be coming and be on the lookout for it. Visibility was less than three miles that day, the squall lines were moving about 60 mph over ground. That meant three minutes to detect and correctly react. If you aren't paying attention or are late in reacting, you may well be screwed as happened in that case. Most guys got in early enough, some did not. 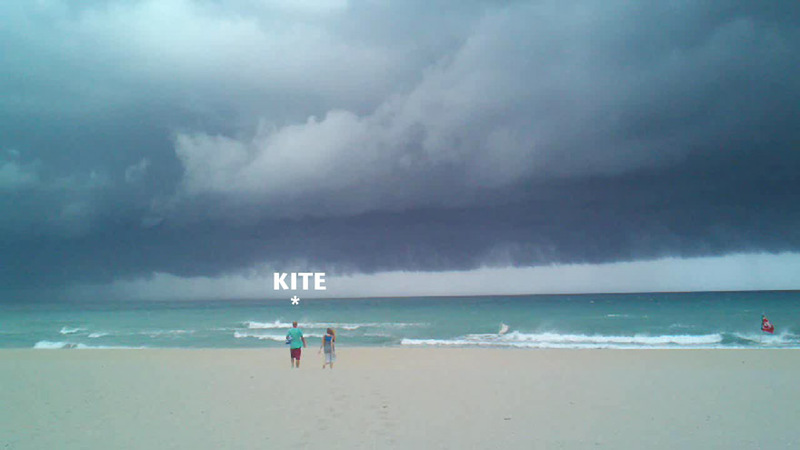 A guy broke his neck in Miami in the same squall line that lofted our kiter into global TV. It was totally unnecessary and avoidable beyond which it wasn't an appropriate day to kite in the first place, the holes between violent squalls were way too small. 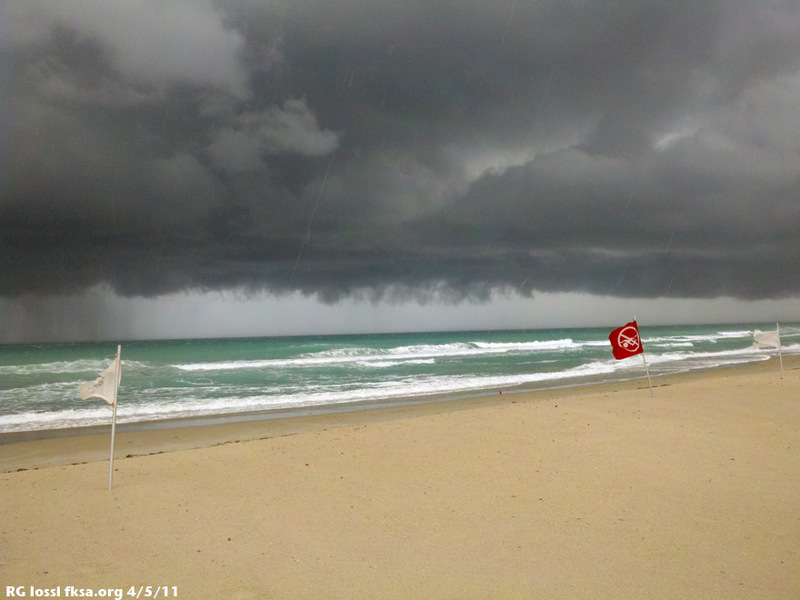 Kiters need to know what threatening local weather looks like and act appropriately in advance as most of us leave the Internet weather resources on the beach, more commonly at home. There is no good excuse for not using them before the session however. It should help you spend more quality wind time, less wind waiting and reduce surprises and the odds of a serious weather problem. RickI wrote: Why would someone risk this in an obvious and avoidable threat? I just finished reading Deep Survival by Laurence Gonzales and he has some insights into the human psyche that answer that question. His example is for "high marking" on a snowmobile but it also would apply to kiting. Anyhow, I recommend the book for anyone interested in the psychology involved with high risk activities and survival. Thanks for the lead, I hadn't heard about this book before. I just ordered a copy. We all take risks, some pretty extreme ones too as it goes with the territory. Still, there are some risks that informed "risk takers" with an eye on living an exciting but full and productive life will avoid. Things like Russian Roulette, driving drunk in white out conditions or on black ice, air diving to 350 ft., glider cliff launch into following, heavily rotored conditions, flying into storm clouds, etc.. These have been established as unacceptable risks in the minds of many people including some devoted risk takers. Over a decade ago the level of sensitivity to kiting in hazardous weather was quite low, virtually non-existent for many. Since that time with each personal extreme experience, fatality and bad accident, posts and articles on the subject, threat awareness has risen. I think the problem with so many folks not giving these "Russian Roulette" weather conditions the consideration they deserve is lack of proper understanding and appreciation of the threat. That is the sheer violence that can come at times and long series of avoidable incidents, accidents and fatalities going right back to the start of kiting. Trivializing something that is largely unknown is a lot easier than something you understand very well. It will be interesting to see what "Deep Survival" has to say about it. Well I think the need to fullfill the kiting addiction can overpower many kiters rational and go out in the incorrect conditions. I think the key too is to understand your local conditions. 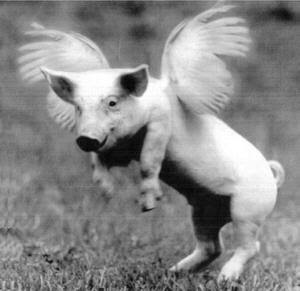 then you can possibly ride relatively safely in marginal conditions. For example locally we will have squally condition in winter. But in for the most part they are small and repeatable. IE sqaulls every 30 mins for 3-4mins. The wind spikes 10-15 knots and the wind can shift 30-45 degrees on those days. with the wind coming cross on that means shifting on onshore or cross shore. On other days when conditions present to be unstable then as you advice it is stupid to go out.